A Closer Look: Rock Monsters Are Dragon Fantasy's Version of Slimes! Welcome to our first ever A Closer Look feature! In this feature we'll discuss about a certain aspect of newly released or upcoming games. In our maiden feature we're going to talk about Dragon Fantasy's flagship monsters Mr. and Mrs. Rock Monsters! Every RPG has a flagship monster, be it a powerful boss, or a weak and cute monster like the Slimes from Dragon Warrior/Dragon Quest games. 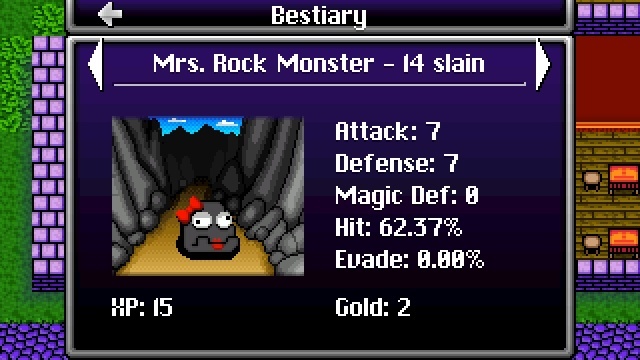 Dragon Fantasy uses the method that Dragon Warrior did with its Mr. and Mrs. Rock Monsters! These monsters are not only the weakest monsters in the game, they're also kinda cute, especially the things that they say in battle! These monsters are great for comic relief and are quite unique which is what every flagship monster should strive to be! Anyways that's all for our first A Closer Look article! Tell us what you think of our feature in our comments below! Re: A Closer Look: Rock Monsters Are Dragon Fantasy's Version of Slimes! This feature is incredibly short, but well-written. What an interesting idea for a new feature!